Ten top European authors recommend three titles each as potential candidates for translation. PARIS: As the world watches the economic and political struggles of the Eurozone, the European Society of Authors (SEA) is searching for ways to “create a real European Union based on cultural and not economic values,” says Katia Flouest, Associate Secretary General of SEA. The organization was founded in 2008 to promote alliances between European publishers, translators, and authors. In 2010, they published the first Finnegan’s List, a project in which each year ten well-known polyglot writers from ten countries are asked to recommend three titles by other writers they feel should be more widely translated. The 2012 list was presented at the Frankfurt Book Fair. Now SEA is getting in contact with publishers, agents, and translators; and planning follow-up events in Budapest, Berlin, and Paris. One writer helping to introduce another into a foreign culture is of course not a new phenomenon. Flouest points to “André Gide championing Dostoyevsky’s work in France or Claudio Magris commenting in Italian on the work of Robert Musil.” It’s an intimate and idiosyncratic kind of advocacy that reveals which writers influence other writers, with no consideration for commercial success or even necessarily larger cultural importance in their home country — in other words, the potential for finding truly hidden gems is high. SEA puts few restrictions on what authors can recommend for Finnegan’s List: “The personal approach is the basic concept of the list; they’re free to choose the books that have been important to them.” That can mean classic books as well as contemporary, and not only literary works, but from any branch of the humanities (though the authors seem to choose mostly literary fiction). Authors offering their selections this year included György Dragomá (Hungary), Hoda Barakat (Lebanon), Georges-Arthur Goldschmidt (France), Vassili Golovanov (Russia), Juan Goytisolo (Spain), Yannis Kiourtsakis (Greece),Terézia Mora (Hungary/Germany), Sofi Oksanen (Finland), Roman Simić (Croatia), and Adam Thirlwell (UK). Though SEA tries to work in a “post-national way,” Flouest is clear that partnering with national organizations is the only viable way to make progress. Some government institutions have been reluctant to contribute funds that may not be used to specifically promote their national literature. 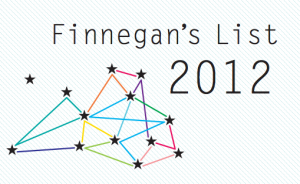 Nonetheless, Finnegan’s List has found supporters in Germany’s Goethe-Institut, France’s Institut francais, and the Netherlands’ Nederlands Letterenfonds: Schwob. And there are some places where SEA’s approach is quite intuitive; for example in the Balkans, or in Austria, Germany, and Switzerland, where languages overflow national borders. Finnegan’s List has had a particularly warm reception in Germany and France. An editor at the French publishing house Actes Sud discovered the German writer Bettina Gundermann through the 2011 list, though they decided to translate a different book than the one recommended. SEA is also collaborating with translators associations, universities, and publishers (including Actes Sud) to establish a social platform for translators, writers, and publishers. 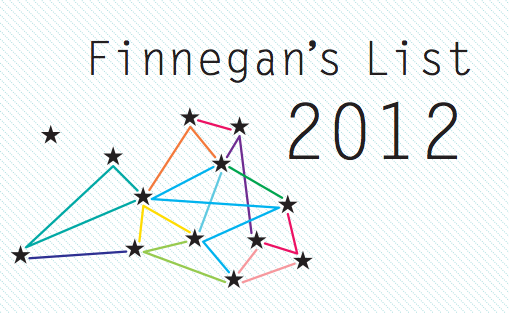 Called TL-Hub, the project aims to make it easier to do the kind of networking that often takes place at book fairs and conferences, and for titles like those on the Finnegan’s Lists to find a home. Another collaboration, with Britain’s And Other Stories Publishing will create a reading group to consider Finnegan’s List titles for translation into English. DISCUSS: What Was Your Top Translated Book of the Last Year?